Universities should abandon lectures and adopt alternate forms of teaching. Most students absorb only a fraction of the content covered in a lecture. Lectures don't let students voice their doubts and questions. That way, they will never fully understand the subjects. Lectures often very closely follow lecture notes and supplementary material. Sitting in lecture can be fully replaced by individually reading those material. Teaching in lecture form relies extensively on students' ability to take notes. Recording information that is uttered in speech only once or a few times is a difficult task when properly done. There is no reason for each student to write down the content covered in its entirety when the same content can be delivered in a different form that is both permanent and well-organized. There is no reason to deliver class material at a particular time and place when modern technologies fully allow instructors to convey information asynchronously through methods such as video lectures. Giving lectures are repetitive for instructors. The redundant parts of lectures can be substituted with a different form of teaching so that instructors can focus on less redundant parts of teaching such as answering questions. Lectures are equal. Everyone is hearing the same thing, at the same time, and with the same opportunity to gain from it whatever they choose. Other forms of teaching like one-on-one or focus group styles lead to some information being taught to some groups, and other groups being deprived of potentially critical information. 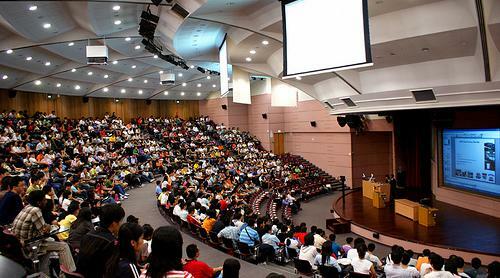 Lectures give students the chance to socialize with a great number of other students. Lectures are cost effective solution in the educational system. More students can be taught at once with one instructor. Lectures keep the costs of higher education from ballooning even further. Being in a lecture allows students to actively engage with the lecturer by asking questions on the fly.